NEW PRODUCT – Universal 1000mA switching supply with 3/4.5/6/7.5/9/12V output « Adafruit Industries – Makers, hackers, artists, designers and engineers! NEW PRODUCT – Universal 1000mA switching supply with 3/4.5/6/7.5/9/12V output. Most of us at some point have had one of those ‘universal’ power supplies, the big bricks with a switch on the side. Those supplies are not regulated, so the output can be up to 2x larger than what the switch says. See our detailed tutorial for more information about this This supply is a regulated switcher so its very efficient and always has the correct voltage output, no risk of over-voltage damage. Pair it with one of our DC barrel jack cables and you can plug it into any breadboard for a fast and easy adjustable power supply. 12V will drive many small DC motors and steppers. Up to 1000 mA at any voltage! 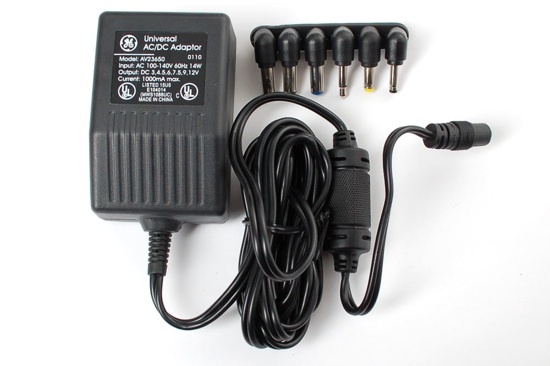 Chances are this can replace any of your power plugs and work as a portable, low cost bench-top supply. Only for use in 120V countries, if you have 220V you’ll need a transformer. US 2-prong plug that folds back. Comes with 6 common plugs. For those of you who aren’t aware, 1000mA = 1 Amp. I point this out due to the fact that there seems to be a frequent attempt here to quote large numbers without simplifying the units. Just take a look at the lipo batteries for further examples.